A grand commemoration was scheduled for 15 July 1906 to mark the 300th anniversary of the birth of the most famous Dutch painter, Rembrandt Harmensz. van Rijn. 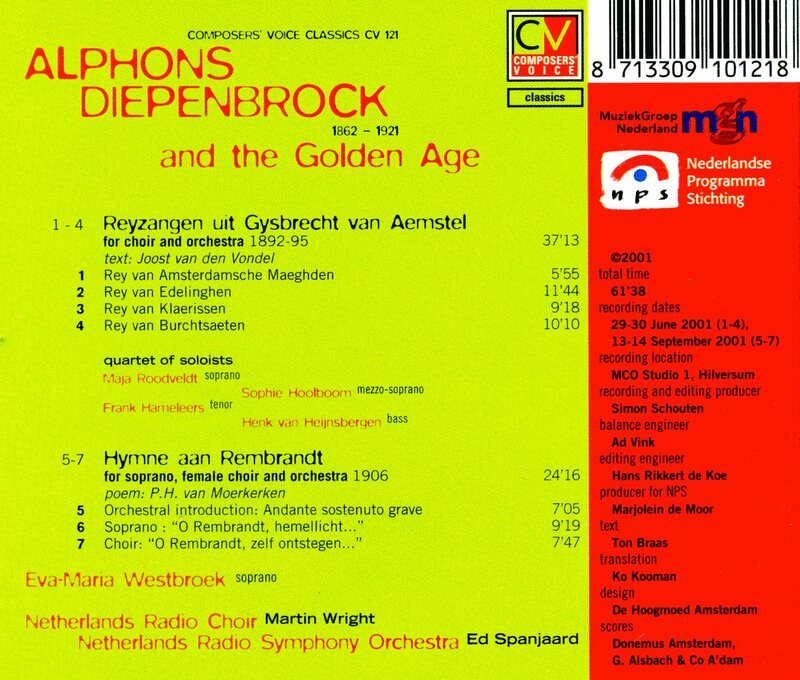 Since the foundation of the “Committee for the celebration of the third centenary of Rembrandt’s birth” at the beginning of 1905, Diepenbrock had been a member. At the end of January the first meeting took place and in February the decision was made to organise an “edifying folk festival” for the entire population of Amsterdam. (BD IV:548) Newly composed music was to sing the praises of Rembrandt. Besides Diepenbrock, who was asked to write a piece for choir and orchestra, Zweers and Mengelberg were requested to collaborate. In April a circular was published explaining the plans for a wide range of events, such as the opening of the new Nachtwacht-zaal (Night Watch hall) in the Rijksmuseum on Rembrandts birthday and the placing of a memorial on his grave in the Western Church. The wish-list also included the publication of a good Dutch biography and a Bible illustrated with etches by Rembrandt; in order to realise these plans, citizens were asked for financial support. The response was such that, at Diepenbrock’s suggestion, at the meeting of 28 October 1905 the decision could be made to purchase the Rembrandt House. In Diepenbrock’s Hymne aan Rembrandt (Hymn to Rembrandt) for soprano, female choir and orchestra turns and chord progression are used that are also found in his Te Deum (RC 39) and Im grossen Schweigen (RC 67), works that were both performed in May of that same year. 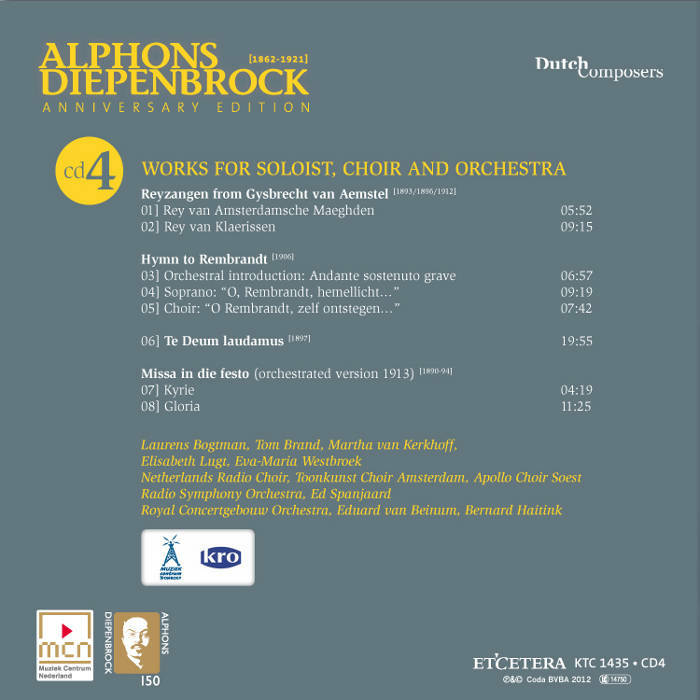 At that time Diepenbrock was particularly busy with the preparations for the premiere of the symphonic song. The extensive orchestral introduction is built on a three-note motive (a descending second and a descending minor second), which in the vocal section is linked to the words “O Rembrandt”. At the beginning of the piece the motive is played in a low register by divided strings, accompanied by a soft timpani roll. Gradually it develops into longer melodies in higher registers. Only after a carefully built up climax, the first collective forte is reached in m. 65. Here, for just a moment, the melody emerges in the 6/4 metre with which Diepenbrock referred to Amsterdam in Vondels vaart naar Agrippine (Vondel’s Voyage to Agrippine, RC 64) by quoting a passage from his Rey van Amsterdamsche maegden (Choral Song of the Amsterdam Virgins, RC 30) – a self-quotation of a self-quotation. After two measures in a march tempo the piece builds up again “with ever increasing rapture” to more expansive melodies that should be played “with the greatest enthusiasm”, culminating in a three-part canonical passage in C major by the trumpets. The cornerstones of their upward melody form a broken triad. Then, after more than seven minutes the solo soprano enters, whose part has been tailored to the voice of Aaltje Noordewier-Reddingius. in strophe 5, the composer uses word painting: we hear trumpet calls and rhythmic figures in the percussion. Diepenbrock quotes the Dutch national anthem Wilhelmus van Nassouwe – the opening line is used as an instrumental counterpoint to the melody in the voice and its continuation “Een Prinse van Oranje ben ik, vrij onverveerd” (Prince of Orange am I, free and fearless) for the conclusion of this section of text. In contrast to this, the setting of the following strophe evoking in words the image of the painting De staalmeesters (The Syndicts) is sedate. The way Diepenbrock has the female choir enter in six-part division at the beginning of the tenth strophe of the Hymne aan Rembrandt, has resulted in two pages that are among the most unique and finest in his oeuvre. Beginning with the third altos, the choral parts start the “O Rembrandt” motive at one-measure intervals, each time a step higher in successive thirds (f#–a–c–e–g–bb, the last note sung by the soloist). The accompanying quaver movement in the orchestra adds additional notes to the resulting chords, such as the hard-diminished minor ninth chord g-b-db-f-ab. When the solo soprano has finished the complete text, the female choir, now divided into 4 parts, sings the strophes 10 and 11. In the harmony there is a noteworthy chord progression of G-flat–D–A-flat that every time accompanies the words “schoonheid” (beauty) and “godlijk licht” (glorious light). The composition ends with a fanfare of ascending broken triads, similar to the conclusion of the orchestral introduction. The Hymne aan Rembrandt was the finale of the festive programme in the Stadsschouwburg (City Theatre) on 16 July 1906, in cooperation with the Concertgebouworkest. After the orchestral overture Saskia by Bernard Zweers, conducted by Mengelberg, the third act of Vondel’s Joseph in Dothan was performed with scenery and costumes designed by the painter and etcher Marius Bauer. Then there was the music Willem Mengelberg had composed inspired by twenty of Rembrandt’s etches, which were projected during the performance. Johan Wagenaar conducted his symphonic poem Saul en David (Saul and David). Willem Royaards and Rika Hopper recited the Ode aan Rembrandt (Ode to Rembrandt) by Jac. van Looy and sections from the tragedy Medea by Jan Six were performed with scenery that was also designed by Bauer. For the presentation of Diepenbrock’s composition the organisation also followed a theatrical concept. Only Aaltje Noordewier-Reddingius was visible on the stage, dressed in a long, white gown in a beam of soft blue rays of light, against a backdrop of purple and scarlet red with a cornflower blue banner. The female choir (members of the Toonkunst Choir and Klein Koor a Cappella) sang from the wings. At their entry the backcloth opened and Rembrandt’s studio appeared with his design for the Night Watch. An angel with a branch of a palm tree stood by the empty chair of the master. The acoustics in the theatre were so unfavourable that the editor of the magazine Weekblad voor muziek, Hugo Nolthenius, announced that he would refrain from reviewing the three new compositions. Diepenbrock also considered the performance invalidated. On 26 March 1908 the piece was performed a second time, now in the Concertgebouw, conducted by Diepenbrock himself. The soloist was Johanna van Linden van den Heuvell, who also performed abroad under the artist name Tilia Hill. 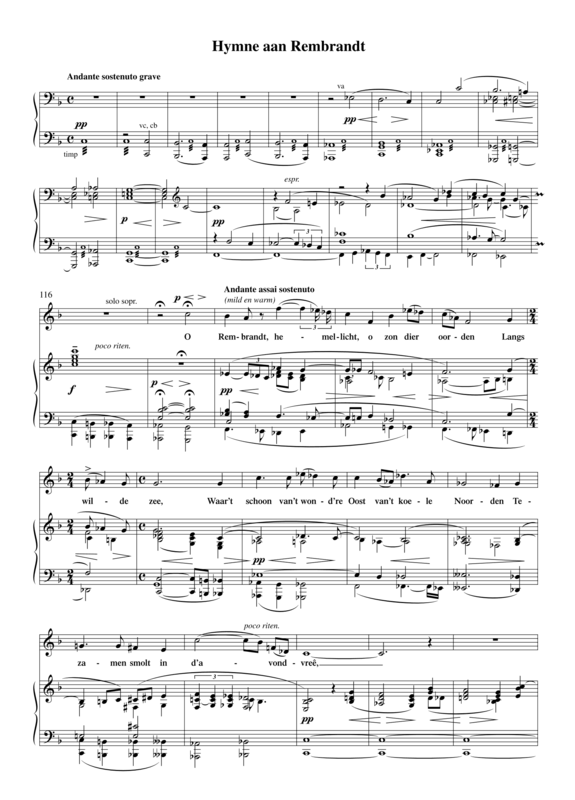 The composer was so impressed with the singer’s execution that he gave her the copy of the piano score from which she had sung. Een God met aardsche doornenkroon. Een glimlach op het streng gezicht. Den Godsgezant van ‘t hoogste Schoon? Van diepe en trotsch gedragen smart. Wijl zon na zonne alreê verzonk. Als dank en bede tot u gaan. In ‘t godd’lijk licht van uwe Zon! 16 juli 1906: Eerste uitvoering van de Hymne aan Rembrandt in de Stadsschouwburg te Amsterdam door Aaltje Noordewier-Reddingius, een vrouwenkoor samengesteld uit koorleden van de afd. Amsterdam van de Maatschappij tot bevordering der Toonkunst en van het Klein Koor a Cappella, en het Concertgebouw-Orkest onder leiding van Willem Mengelberg. Toneelschikking verzorgd en geschilderd door W.P. de Leur. Het programma van deze feestavond ter ere van Rembrandt bestaat uit de orkestrale inleiding Saskia van Bernard Zweers (gedirigeerd door Mengelberg), het derde bedrijf van Vondels Joseph in Dothan, twintig etsen van Rembrandt, geprojecteerd met begeleidende muziek van Willem Mengelberg, het symfonisch gedicht Saul en David van Johan Wagenaar (gedirigeerd door de componist), Ode aan Rembrandt van Jac. van Looy, voorgedragen door Willem Royaards en Rika Hopper, fragmenten uit het treurspel Medea van Jan Six, en ten slotte de Hymne aan Rembrandt op een gedicht van P.H. van Moerkerken jr.
De gala-voorstelling in den Stadsschouwburg op hedenavond, was het besluit der Rembrandthulde, door de algemeene commissie gearrangeerd. Kunstgenot, stemming zelfs, heeft de avond wel gebracht, maar lang niet onverdeeld. Begin en einde hebben ons het meest kunnen bekoren. Het derde bedrijf van Joost van den Vondel's Joseph in Dothan, opgevoerd nadat het Concertgebouw-orkest de orchestrale inleiding Saskia van Zweers had gegeven, bekoorde door décor, kostuums en compositie vooral. Juist belicht geeft het tooneel een artistiek effect, nu en dan een fraai schilderij. En het slotnummer, de Hymne aan Rembrandt, stond niet minder hoog. — Aan Diepenbrock, den componist ervan, danken wij het, dat we ten slotte in de goede stemming kwamen. Hij heeft ons met zijn diepe muziek kunnen treffen, en in mevr. Noordewier-Reddingius had hij een vertolkster gevonden, die met haar engelreine stem de hymne opwaarts droeg naar Rembrandt. Zij zong de hymne, door dr. Van Moerkerken gedicht, in huisgewaad, zonder mise-en-scène, in een stralenbundel staande van witblauw licht. En tusschen haar zangen klonken de strofen van een onzichtbaar krachtig vrouwenkoor, verheerlijkend en dankend den Meester. Het nummer eindigde met een apotheose. — Het achterdoek viel open en toonde ons des Meesters atelier met de ontworpen Nachtwacht. Een engel met palmtak stond bij den ledigen stoel. Vooral ten slotte was de muziek en daarmee de zang schoon en verheffend. — Voorts gaf het program Saul en David, symphonisch toongedicht van Joh. Wagenaar, rijk aan zetting en mooi van harmonie; een dichterlijke Ode aan Rembrandt van Jac. van Looy, hoogst verdienstelijk door Rika Hopper en Willem Royaards gedeclameerd; fragmenten uit Medea van Jan Six; en etsen van Rembrandt. — Sommige projecties rafelden de voorstelling door de vergrooting te zeer uiteen. Anderen, de diepere voorstellingen, zooals “Christus' prediking” en “Christus op den Olijfberg”, vond ik bepaald fraai, maar och lieve, wat werd me hier het genot vergald door de muziek, die W. Mengelberg bij de vertooningen had gecomponeerd en nu deed uitvoeren door het orkest. Bij Rembrandt's rijke voorstelling die heel een wereld soms beduiden, hebben we geen muziek noodig, maar vooral geen gebral van koper, hoogstens dan een heel zacht accoord. Hulde verdient de regie van De Leur, en hulde ook aan de commissie, die, al heeft ze niet kunnen bereiken wat ze beoogde, voor het pogen reeds lof toekomt.